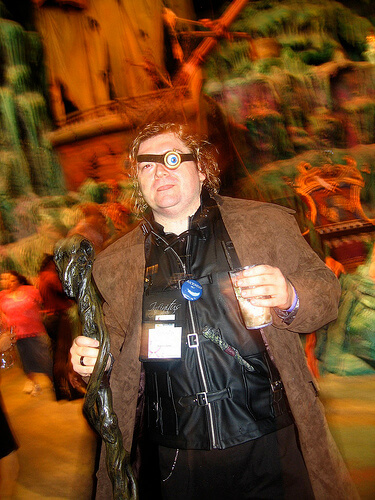 Thousands of the world’s most-devoted Harry Potter flocked to Orlando for Infinitus 2010, a Harry Potter conference at Universal Orlando that took place July 15 – 18, 2010. The conference, the seventh of its kind from a Potter fan organization called HP Education Fanon, Inc. (HPEF), was the first to not only bring Potter fans worldwide togetherin Orlando, but also to offer many attendees a dream trip to finally step foot inside the famous Hogsmeade Village and Hogwarts Castle, as created by Universal Orlando in the new Wizarding World of Harry Potter expansion of their Islands of Adventure theme park. The Night of a Thousand Wizards was planned as an after-hours party. It kicked off with an hour-long presentation made by Universal in the nearby Sinbad theater that included a Q&A session with Wizarding World designer Paul Daurio (more on this in a future article). 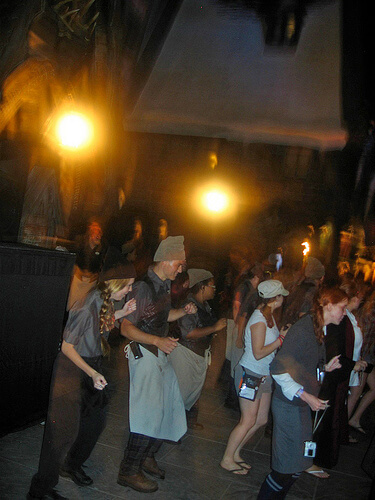 Once inside the Wizarding World, a DJ was present just outside the Three Broomsticks restaurant for the second half of the night, blasting tunes that included Beyonce’s “Single Ladies” and the infectious “Cha Cha Slide” by DJ Casper (some of the Three Broomsticks staff even joined in for this one, pictured here.) A dessert bar and treats from Honeydukes were all laid out for unlimited enjoyment. Best of all, the Butterbeer was free flowing. (I had four in two hours, likely one too many.) But it wasn’t the music, the food, or even the Butterbeer that made this night one to remember. 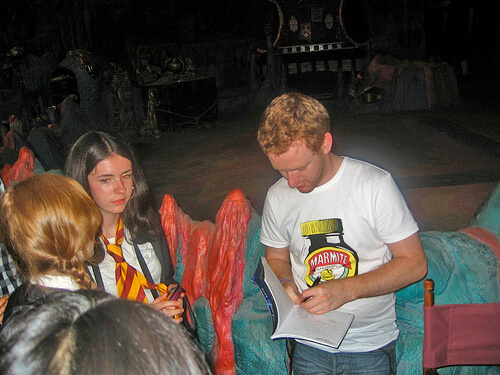 In talking with fans throughout the Night of a Thousand Wizards, it became clear to me that extra magic was in the air. A special feeling flowed through the crowd, as if everyone felt at home despite the fact that many had never stepped foot inside Universal’s Wizarding World before. Attendees had often imagined themselves walking through Hogsmeade Village and into Hogwarts Castle long before Universal had even decided to built them. 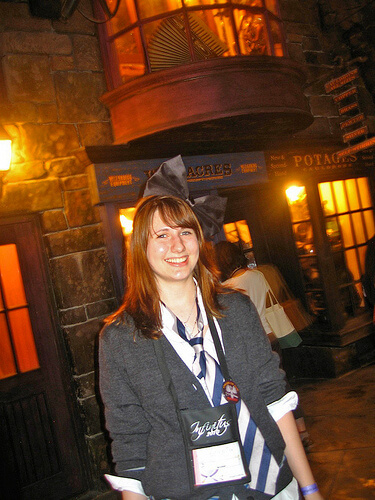 19-year-old Archer Chatton (pictured below) started reading Harry Potter books when she was just five years old. She was now able to literally walk through the world she had imagined so many times over the last 14 years. 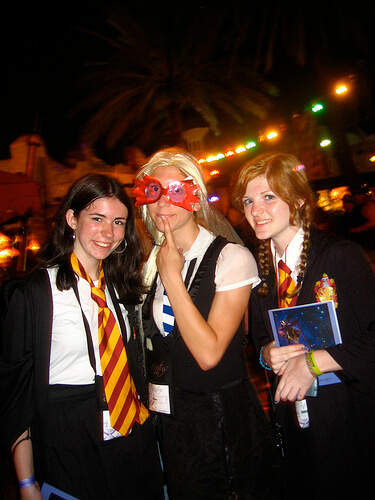 The vast majority of those costumed for the Night of a Thousand Wizards arrived as Hogwarts students, as if they were returning for a new school year. I spoke with a trio of would-be wizards, Laura Riley, Diane Osborne, and Holly North, who were vacationing from New Jersey. It’s that kind of excitement that will continue to draw the millions of Harry Potter fans around the world to Universal Orlando – and many more than once. Tess and Leah flew down from Toronto, Canada (also dressed as Hogwarts students). The Night of a Thousand Wizards was their second trip into the Wizarding World, having already been there for its soft opening phase weeks prior. While walking through Filch’s Emporium, the exit gift shop to Forbidden Journey, I caught a Universal team member (employee) smiling while watching happy Potter fans browse through the store. I asked if she was enjoying the night and she emphatically told me it was a wonderful change from dealing with cranky, hot day guests who seem to be filled with nothing but complaints (some valid, some not). It was obvious that the Wizarding World was built with fans in mind and it was a joy to see them enjoy it, even for those on duty. Living just 30 minutes from Universal Orlando, it’s been a treat for me to be able to drive over to the Wizarding World on a whim. But no trip there tops the first one, walking through Hogsmeade Village and rounding the corner to see Hogwarts Castle for the first time. 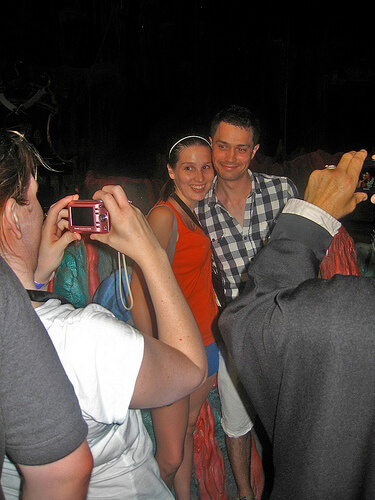 Fortunately, that once-in-a-lifetime magical moment can be relived by accompanying visitors who haven’t been there before. And on the Night of a Thousand Wizards, there were hundreds of wide-eyed Potter fans who couldn’t believe they were truly standing in front of Hogwarts Castle. 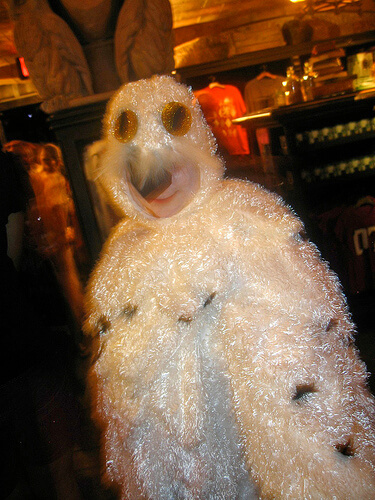 I heard excited giggles from nearly every corner of the Wizarding World as attendees discovered new details in Hogsmeade shop windows or simply took a moment to appreciate where they were standing. I ran into one well-known Potter fan just moments before she first laid eyes on Hogwarts. Her name is Mandala (pictured below as a Beauxbatons student with her husband Olek) and she is active in what’s called Wizard Rock – original music centered around the Harry Potterverse. 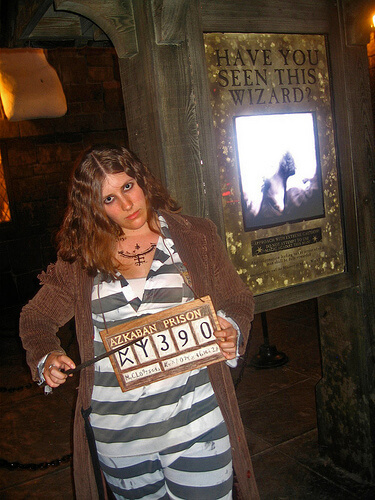 She’s known best in the Potter community for her “wrock” band WitherWings. A former Orlando resident, Mandala moved away before the Wizarding World was completed. So while Infinitus was her third Harry Potter conference, this night was her first actual journey into Harry Potter’s world. As we walked and talked through Hogsmeade, she stopped mid-sentence upon spotting Hogwarts Castle for the first time. She quietly uttered, “Oh my gosh, look at the castle. Just look at it. Wow.” I gave her a moment to take it in before asking what she thought about it. “The castle is breathtaking,” she said. “And to see it at night – look at the stars – it’s unbelievable.” Ordinarily a rather articulate and outgoing person, Mandala was left nearly speechless. Before I left her to enjoy the night, I asked what her favorite part about the idea of the Wizarding World of Harry Potter is. She said it was “for us to actually get to walk around in Hogsmeade and in Hogwarts and for just a moment suspend reality.” And that is the magic of a theme park, removing guests from the real world and placing them, in this case, somewhere they always wished they could be. It was all emphasized by a special night surrounded by those who share the passion and appreciate it just as much. While the Night of a Thousand Wizards was glowing with childlike excitement, the average summer day inside the Wizarding World of Harry Potter is currently (and unfortunately) filled with large crowds, long lines, and hot weather. But if the event described above sounds like the perfect idea of fun for you, don’t worry about missing it. It won’t be too long before another Harry Potter fanfest arrives. 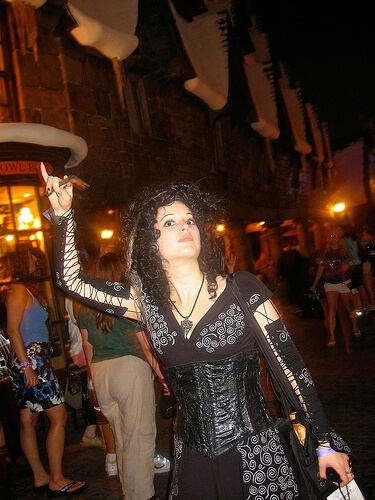 Aziza Abu Butain tells me HPEF is already planning their next Harry Potter conference called Ascendio for 2012 and it will be back here in Orlando once again. 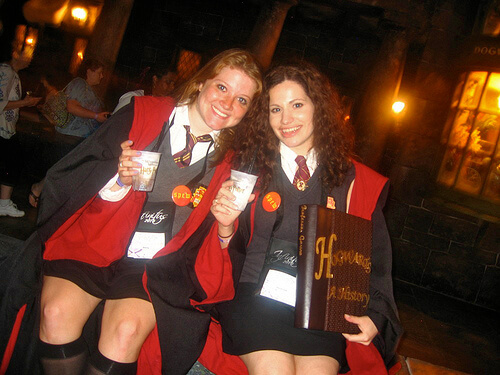 Or if you can’t wait that long, another fan convention called LeakyCon (unrelated to HPEF) will feature similar programming in 2011, promising plenty of Harry Potter excitement and even a special event inside the Wizarding World. It’s clear to anyone visiting the Wizarding World of Harry Potter that Universal Orlando has outdone themselves in creating this highly-detailed new environment. But it was the excited fans that truly made the area come alive during the Night of a Thousand Wizards, adding a special kind of magic that doesn’t come from a wand, but from the camaraderie you can’t find on an average theme park day. Great article, Ricky! My girlfriend and I had the pleasure of experiencing the Wizarding World during a soft opening. I completely agree about that first time feeling, especially since we hadn’t even planned on entering that day. Since the Official Opening, though, it’s really been trying being there with the “Summer Crowd”. I could imagine being with true fans would really make the experience enjoyable once again. Hopefully when the crowds die down…it’ll be as enjoyable for me as that first time. 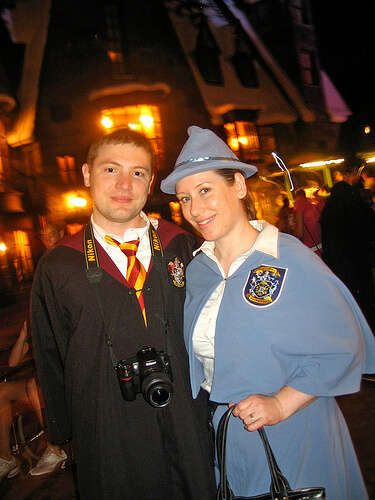 Infinitus was the 3rd HPEF event my wife and I attended and we LOVED LOVED LOVED being able to explore the WWOHP during the Night of a Thousand Wizards!!!! AMAZING experience – so thank you to everyone and anyone who had anything to do with it! Please pat yourselves on the back from us! where can i sign up to attend one of these? i love harry potter, and live in canada and never heard of this.